Each summer, from mid-June to the end of August, the cultural institutions of Cleveland's University Circle sponsor a series of free Wednesday concerts, ranging from jazz to big-band to classical. The events are held from 6pm to 9pm. In addition to music, many of the area's museums offer extended hours and discounted admission and area restaurants offer samples of their cuisine. The 2015 dates are Wednesdays from June 11 to August 27. August 12 - "Big Hero 6"
Wade Oval Wednesdays feature a wine and beer garden with a view of the stage. In addition, the Cleveland Botanical Garden sponsors "Gourmets in the Garden", where visitors can sample food from area restaurants. There is a small admission fee. During the Wade Oval Wednesday events, many of the University Circle museums, including the Cleveland Museum of Natural History and the Western Reserve Historical Society, offer discounts and extended hours. Metered parking is available around Wade Oval. In addition, discounted parking is available after 5pm in the Cleveland Museum of Natural History and the Cleveland Botanical Garden lots. 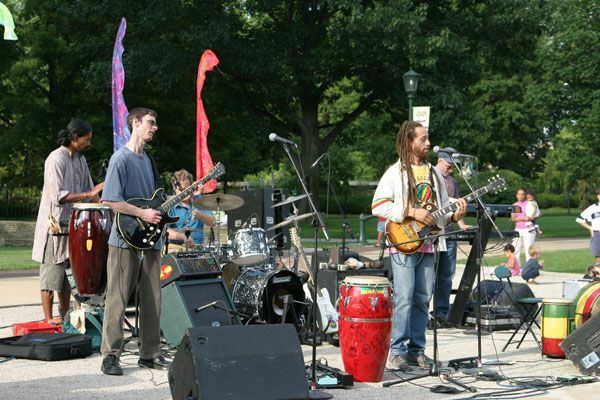 In addition to the music on Wade Oval, the Cleveland Museum of Art sponsors free concerts in their outdoor center courtyard during Wade Oval Wednesdays from 5pm to 9pm.